Superstition mountains are located in Arizona. The biggest of them is the mountain of superstition and east of it there is severe erosion, which plays a major role in the local legend of the mysterious gold mine of the Lost Dutchman. On the north side of the Superstition Mountains is the Peralta Canyon, where you can take the famous tourist route that leads to Freemont Saddle, where it opens a magnificent view of Weaver's Needle. Another popular destination for climbing is Miner's Needle. The Superstition Mountain scares some tourists with its desert climate, which offers high summer temperatures and lack of water resources. However, there are many climbing paths, among which the most popular is Peralta Trailhead. The park of the Lost Dutchman, which is located in the western part of the Superstition Mountains, offers magnificent views. 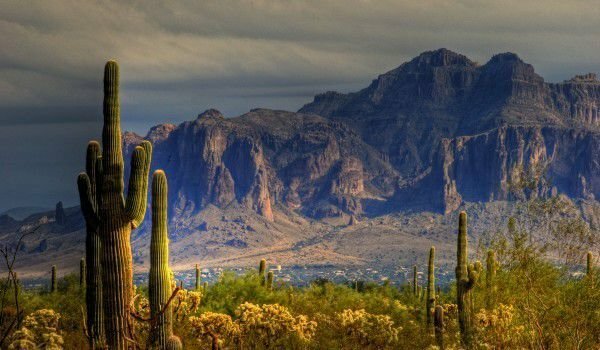 The name of the Superstition Mountains occurred because the legends of the Pima Indians. Some Apaches believed that the hole in the mountain of superstition is the passage to the underworld, which is under the mountains of superstition. The whole area is filled with ancient caves and places where ancient Indians lived, as their presence is evident on many facts. It is still not clear who were the people who inhabited these caves - whether they were Indians Salado or Hohokam. Later, Apache and Pima Indians inhabited the area. The very name of Apache is closely related to the superstition mountains. In 1840 the north American Peralta family discovered a rich gold mine in the mountains of superstition. Their last expedition to earn gold in Mexico occurred in 1848. According to legend, this expedition was attacked by Apaches and all the family were killed except for two members of the Peralta family who managed to escape to Mexico. The area in which the people from the expedition were killed is known as Massacre Grounds. Very few people knew the exact location of the gold mine, the number of workers on it have been limited. Many maps have survived over the years, only to be lost forever. People who claimed to have discovered the location of the Peralta mine were unable to return there or some misfortune happened to them before they reach the legendary area. Legend of the lost gold mine of the Dutchman says that the German immigrant named Jacob Walzer found the famous Peralta mine. He worked hard in the mine and managed to hide part of the gold somewhere in the Superstition Mountains. Walzer moved to Phoenix because of ill health and died in 1891. He described the location of mine to a neighbor who cared for him until his death. But nobody was able to find the lost gold mine of the Dutchman.